Since Lent is over I’m back to reading fiction and will be posting more book reviews frequently. Before I attacked my stack of Tana French books or finally picked up Special Topics in Calamity Physics, Chuck insisted I read One Second After. He said it would turn me into a doomsday prepper. I gotta say – it definitely gave me pause. First, I must tell you that One Second After will not be winning any literary awards, so don’t go into it thinking you’re going to read a masterpiece. This is a plot-driven book, so there’s little to no character development, no matter how hard William Forstchen tries. But honestly, that’s not the point. All aircrafts in-flight would drop from the sky, trains would crash, and modern cars would die because any vehicle, aircraft, or transportation system that utilizes a computer system will instantly become paperweights. All shipping and transportation would cease, so that means grocery stores don’t get groceries, hospitals don’t get medicine or supplies, and so on. Whatever is in your town at the moment of the EMP is all that will be in your town for an extremely long time. As a result, anyone in critical condition (the elderly, those who rely on medical treatment like dialysis and chemotherapy, or those with Type I Diabetes) will die sooner than later. With medical supplies wiped out and nothing to replenish them, modern medicine evaporates. Simple drugs like pain killers become a form of money. Folks with addictions will quickly lose their minds because alcohol and recreational drugs will be forced clean. People on antidepressants and anti-psychotic drugs will suffer because their body chemistry will permanently shift. It won’t be pretty. Everyday procedures like childbirth will become precariously dangerous. Basic first aid can turn life and death. With no outside communication, you won’t know what’s going on, who attacked us, or what the country is doing to stabilize itself. People will lose their minds even more because of the isolation. Will it be weeks until electricity is restored? Will it be months? Years? Worse, if you were separated from your family at the time of the EMP, you’ll have no way to communicate. No hot water, no fresh food, and eventually no clean water because our dams and water treatment plants are run by computers. Good luck drinking from that murky creek. I could go on, but we’ve all seen enough apocalyptic movies and television shows to know that things get bad. Unfortunately, that’s not the end of the problem, because not having electricity doesn’t seem like a big deal if you’re into camping or if you know how to build a fire. It’s bad because human nature prods us towards animalistic behavior in times of desperation. For example, would you kill someone for food if your child was starving to death? Would you eat your own dog or cat? Would you risk your own life to defend your town and its resources from outsiders looking to pillage? More so, would you even know where to start? 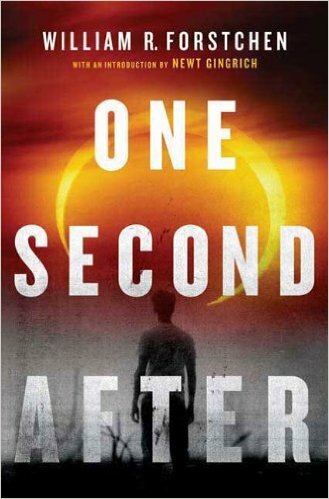 So that’s what’s One Second After is about. It serves the purpose of making you evaluate your own readiness. Sure, it’s good to have a little stockpile of canned goods and First Aid Supplies, and yeah, pack up extra dog and cat food for your fur babies. But what about when that supply runs out? When there’s no more medicine, no more food, and no means to procure any? And what happens when someone comes to your front door with a weapon and demands all that you have? No, I’m not a doomsday prepper, but this book got my brain churning. Our lives are wholly dependent on modern technology. To lose the computer chip is to lose our livelihood and means of existence. Surviving an EMP is less about reverting to instant coffee and candlelight at night. It’s about starting from scratch with no outside help.